About All Things New Mexican! Logan, New Mexico. It’s been home to me since 1964, when my daddy decided he could make a fortune farming here, and we pulled up stakes and left San Jon for greener pastures. It’s generally a great place to live, even if we didn’t make that fortune growing broomcorn. It’s small – pop 1,094 in the 2000 census. Safe – No violent crimes that I can recall, other than that one really awful homicide suicide back in 1973, but that was family stuff. Clean Air. Good Schools (more on that later). And a rich history, about which I’ve been reading for months, trying to think of a way to write about it without sounding dry and boring. Like most small towns in the West, Logan wouldnt’ exist if it wasn’t for the railroad. The Chicago, Rock Island and Pacific Railroad moved into northeastern New Mexico in early 1900 and began building a line down the east side of the state. 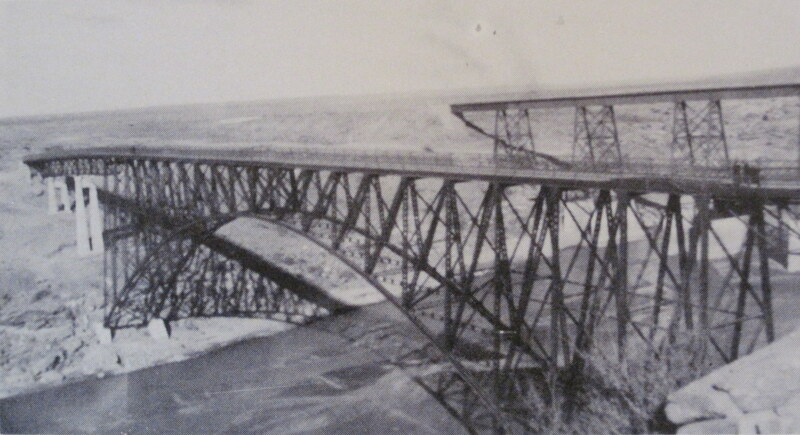 When construction of the line reached the north bank of the Canadian River, everything came to a halt while a bridge was built across the deep ravine of the Canadian. In 1901, John and Anastacia Burns, were moving west and looking for a place to start a new life and business. Their path intersected with that of the railroad construction crews on the Canadian, so the Burns did what any enterprising couple would have done at the turn of the century – they pitched a tent and opened a general mercantile, with supplies being hauled in from Channing, Texas by wagon. Thus, the first small business in Logan, New Mexico was born. By the way, as luck would have it for the Burns, the first bridge washed out in 1901 because of bad footings. The construction crew stayed and built a second bridge, which still stands as the railroad crossing over the Canadian just south of Logan. The Burns family made so much money that first year they were able to build a permanent general mercantile building in Logan. The history I’ve been reading says that in 1904, “because of family tragedy”, the Burns family sold out to Weber and Dietrich and moved to Nara Visa. 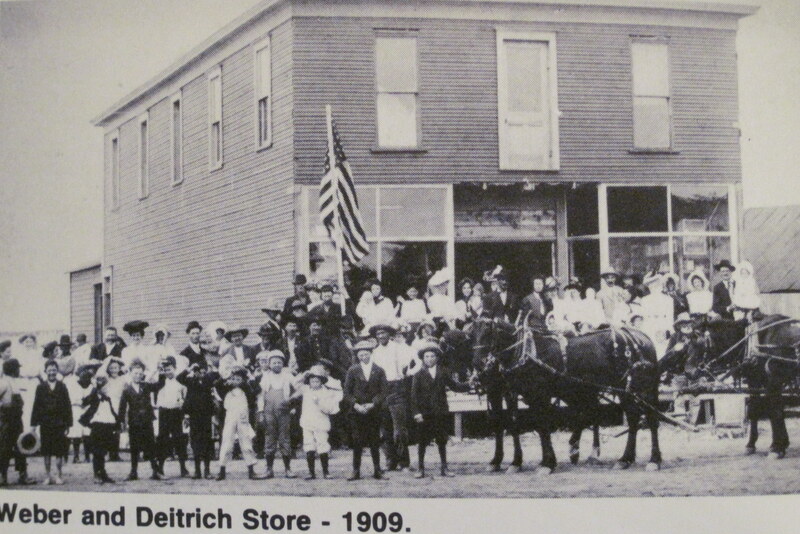 There they bought the McFarland mercantile business, which was sold so that the McFarland Brothers, Sim and Fred, could come to bustling Logan and built a bank. There’s more. Lot’s more. Assuming that I’m more of a history buff than the average Quay County fan, I’ll save it for another post. I love this stuff. I knew you were buff…. but History Buff?? Like it. See you next week Miss History Buff. Dry and Boring you will never be – good stuff! Great post, Bunny! Keep these history ones coming! I was wontering if you could clarify the caption under the photos. The second photo from the top appears to show the existing railroad bridge in the background leading me to wonder if the arch bridge in the forground is the old bridge that is no longer there today. 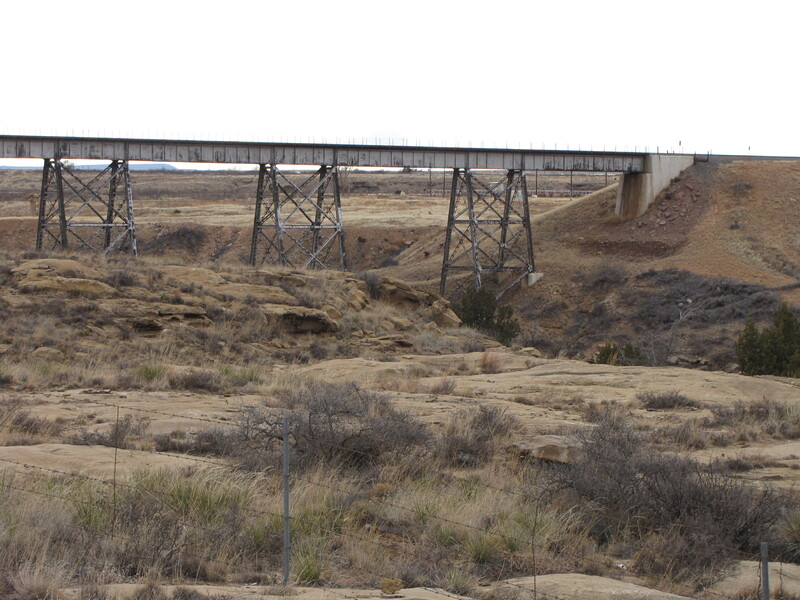 I had also heard that US54 had been on or close to the ach bridge alignment at one time (prior to 1954). Do you have any information on that bridge, or is it possible that the Arch bridge is the old (pre 1954) highway bridge? In any event … great stuff! Steve – The second photo has the railroad bridge in the background and the OLD hwy 54 bridge in the foreground. That old bridge doesn’t exist anymore. Is that helpful? John Burns is my great, great, great, grandfather! If you don’t mind sharing i would like more info. Thanks for the info on those bridges! I just came through that area yesterday on my way back to Texas from Colorado and stopped to take pictures of the railroad bridge. I saw the remnants of the footings of the old roadway bridge and the cut on the south side but wasn’t quite sure what it was for. The old footings didn’t look wide enough apart to support a road bridge. Just a note, the railroad bridge is in the background and the roadway bridge is in the foreground. Subscribe by Adding Your E-Mail Address! Buneesa K. Terry and I Love New Mexico, 2009. Unauthorized use and/or duplication of this material without express and written permission from this blog's author and/or owner is strictly prohibited. Excerpts and links may be used, provided that full and clear credit is given to Buneesa K. Terry and I Love New Mexico with appropriate and specific direction to the original content. An infringement of this notice will result in filing a Digital Millennium Copyright Act claim.